I decided to become a lawyer at age 12, but I can’t remember why. After law school, I chose family law because I wanted the challenge of helping individuals during one of the most difficult periods of their lives. I also wanted the opportunity to both settle cases and go to court. I was fortunate to get an opportunity to practice in the field in which I was most interested. I moved to Baltimore right out of law school. Since I didn’t grow up in Baltimore, I didn’t have previous connections. However, I was hired as an associate at a large law firm, which helped me begin to make connections. I took a few steps early in my career that served as a platform for my law practice and involvement in the business community. Those interactions got my name out there and helped me make connections despite the fact that I wasn’t from Baltimore. I volunteered for political campaigns and nonprofits. I met a lot of people by volunteering and gained fundraising skills that continue to help me to this day. Through a friend from law school, I was chosen for the board of a grass-roots, nonprofit organization, the Neighborhood Design Center. Although this organization wasn’t directly in my field, I took the opportunity to be on a board and learn nonprofit Board governance and fundraising and make new contacts. I took every opportunity that I could find to do public speaking and make presentations. There was nothing that wasn’t a good enough opportunity for me. I spoke in church basements and to very small groups. It was great practice and a way to become known as a young attorney. The more I spoke, the more invitations I received to speak at future events. Ultimately, that helped me obtain experience that aided me as a trial attorney. How important it is to have a mentor when you are a young lawyer or professional. This was an absolute key for me in building my practice. I was very fortunate in that the two partners I worked for took the time and interest to mentor me and promote me in the legal and business community. There’s never a dull moment in family law. There are new legal developments frequently. I continue to think that I help people who are going through a significantly bad time in their lives and that I can make something of a difference for them and their children. I was the chair of the board of Planned Parenthood of Maryland, a large nonprofit health care provider and advocacy organization. It was a great experience and I think I actually made a difference in people’s lives, especially low-income women. I’m now lucky enough to serve on the board of the Downtown Partnership of Baltimore. I’d like to continue board service on other nonprofit boards. I’d also like to continue mentoring young lawyers, especially young women attorneys. I feel that’s an area in which I can make a contribution because of the excellent mentors I had as an attorney early in my career. Get a mentor! Even if there isn’t a natural one, like a boss, find someone who will give you the time and enthusiasm to mentor you and ask them to do that. Always pay it forward! I believe that is the obligation of anyone who’s had a good mentor. Little clients grow into big clients. Small referral sources grow into large referral sources. So, if you are a young attorney or young professional, start by networking with people in your generation — your peers. They will grow professionally and in business to the point where they will be able to refer clients and business to you, even though they can’t when you first meet them. And, do the same for them when you’re able to do so. In addition to public speaking, getting involved and volunteering for nonprofit and political campaigns (if you are interested in politics). Join networking groups that have professionals who are likely to or could refer business to you. Also, look for organizations and networking groups where there is no one or very few others in your field. Listen to your instincts. The times I haven’t done that are the times I’ve regretted something that I’ve done or not done. I grew up in Milwaukee and also lived in London as a child. 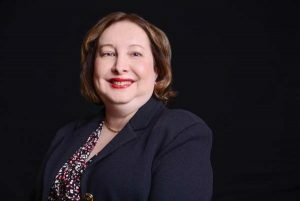 I’ve practiced family law for 30 years, am a partner at Tydings & Rosenberg, am co-chair of the firm’s Family Law Practice Group and I regularly do presentations on family law topics to various professional groups and organizations. • I didn’t grow up in Baltimore. • I wrote my senior thesis in college on the English Renaissance and Reformation. • I wish I’d minored in psychology as that would have been very useful in my family law practice.